The information below is taken from the Badatz Eida Chareidis 5774 Guide. Opinions expressed in the article are those of the badatz unless stated otherwise. 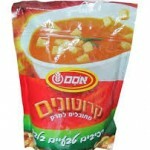 In Israel there are different kinds of croutons sold commercially, croutons for soup and croutons for salad. Other than taste preference and price, what might be another difference you ask? One area where the two may differ is placing these croutons into a bowl of hot soup on Shabbos. The soup croutons are deep fried and are therefore not problematic. They may be placed into hot soup as is the case with soup nuts (almonds) certified by the badatz. The salad croutons are not fried however and placing them into soup that is hotter than yad soledes bo presents issues on Shabbos for fear of בישול אחר אפיה, cooking after baking. The bracha on the croutons is ‘Borei Minei Mezonos’ for the bread used to make them is not regular bread, but a loaf not viewed as really edible, made specifically for the crouton production. Is it mezonos for both soup and salad croutons? 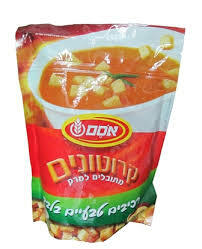 “”"The bracha on the croutons is ‘Borei Minei Mezonos’ for the bread used to make them is not regular bread, but a loaf not viewed as “really edible,” made specifically for the crouton production.”"” This also holds true for another OSEM product, ‘BISSLI.’ Like the croutons, they are made from weeks old unsold moldy bread returned by the stores to the two major bakeries in Israel. These breads then go through a whole process where they are then turned into Croutons and Bissli. Do you really know where and how your food / snack products are produced?